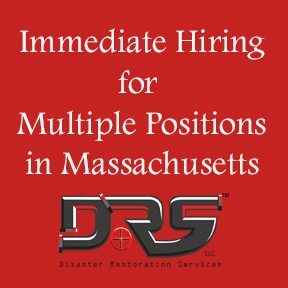 Immediate Hiring for Multiple Positions in Massachusetts - Disaster Restoration Services, LLC. Looking to join a growing company? Disaster Restoration Services is hiring for full time positions with benefits, competitive pay, and the ability to grow! DRS is looking to hire fast and to fill the multiple positions that we have open. Please fill out an application at https://drscleanup.com/application/ if you are interested in one of the positions listed above.